Please join us on our upcoming Winter and Spring hikes (hike schedule flyers are posted below). *To get to Andora Trailhead: Take Lassen Street west to Andora Avenue. Turn left and the entrance to the park is on the right (west side of the street). **To get to Larwin Trailhead: Take Devonshire Street west past Valley Circle Boulevard. After Valley Circle is Larwin Avenue. Turn left and look to the right (west) for the power lines. The entrance to the park is right under the power lines. From Lake Manor, take Box Canyon up and over the hills to Santa Susana Pass Road, turn right, and then right on Lilac Lane. If you come to the Rocky Peak exit, you have gone too far. Other regularly scheduled, docent led hikes will be posted here. Additional and last minute hikes may also be listed on our The North Face Planet Explore page. The stagecoach passage through the Simi Hills was so treacherous it bore the name Devil’s Slide. The Santa Susana Pass State Historic Park celebrated Chatsworth’s 125th anniversary on Sunday with a hike up the Stagecoach Trail led by volunteer John Luker. On the National Register of Historic Places, the Stagecoach Trail was built upon what was then a Chumash trail in 1861. Christened El Camino de Santa Susana y Simi, the passage through the Simi Hills was so treacherous it bore the name Devil’s Slide. The Devil’s Slide was so steep, during its heyday a massive oak timber was placed through the back wheels to keep the stagecoach from hurtling headlong over the cliffs to the north, and down into the deep gorge below. Horses were unhitched and walked down, blindfolded. All but the most delicate passengers were encouraged to disembark and walk. The most expensive fare allowed one to remain inside, with those who walked paying a cheaper ticket price. The least expensive fare was reserved for those hardy souls who not only walked, but also helped to push the stagecoach up the Devil’s Slide, en route to San Francisco. Today the Stagecoach Trail is open for hiking, where trekkers can see ruts grooved into the sandstone from stagecoach wheels, and experience the same sensational views of the San Fernando Valley witnessed by early travelers upon the dramatic incline. The hike itself is 3½ miles, difficult in terms of strenuousness, and can be accessed through the Lilac Lane or Larwin Street entrances to the Santa Susana Pass State Historic Park. Hikes up the Stagecoach Trail are scheduled the second Saturday of every month, 9 a.m. at the Larwin Street entrance. 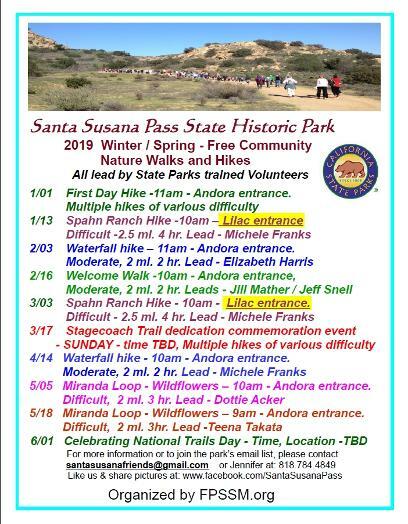 For a complete schedule of hikes in the Santa Susana Pass State Historic Park, visit fpssm.org, or email santasusanafriends@gmail.com. These hikes are organized by the Foundation for the Preservation of the Santa Susana Mountains and led by park docents and hike leaders from the Santa Susana Volunteers. A Plant and Wildflowers Hike through the Santa Susana Pass State Historic Park kicked off the Spring hike season this past weekend. 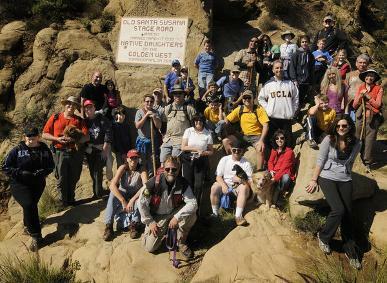 Peter Ullrich, a volunteer docent expert on local plant life and native vegetation, led a group of 33 hikers, accompanied by seven leashed dogs, through the park's trails Saturday, ending up at the historic plaque on Devils Slide. He identified and explained the many species of native plants -- some of them unique to this Park -- along with the invasive, non-native ones, that the hikers encountered along the trails. 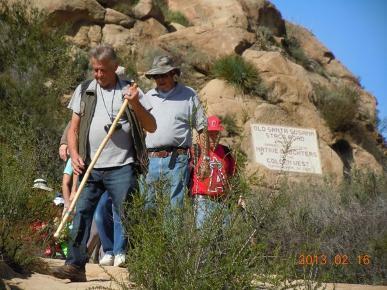 Spring hike season opens at Santa Susana Pass State Historic Park. The California Department of Parks and Recreation periodically offers a volunteer orientation training for the Santa Susana Pass SHP. Topics covered in the training include an introduction to State Parks and its staff, procedures, volunteer opportunities, and meeting some seasoned volunteers. To be considered for the next training, which is scheduled for Saturday May 4, 2019, send an email to SantaSusana@parks.ca.gov or call 818-784-4849. Trail Observers of Santa Susana (TOSS): Be the eyes and ears of State Parks by observing and reporting updates, potential issues to the appropriate personnel while out hiking and enjoying the park. Park Preservers: Participate in work parties to help keep the park clean and safe by removing graffiti and assisting with other park projects. Interpretive Programs: Help educate the public by assisting with interpretive hikes, and school programs. Weed Warriors: Join others in eradicating non-native plants from the park. A volunteer training flyer will be posted below once the next training date has been announced. Please note the application deadline is typically one week prior to the training session. Class learns to use hand and bow drills the Native American way. 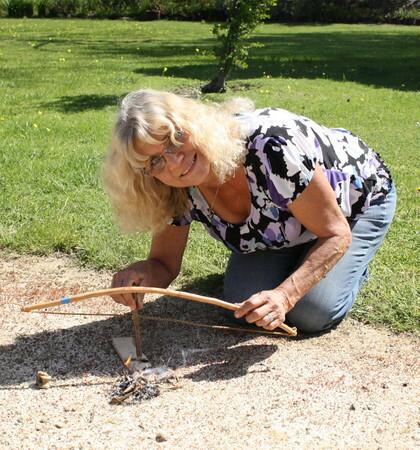 A traditional fire-making class was held at the Chatsworth Historical Society’s Acre on Saturday. Sponsored by the Foundation for the Preservation for the Santa Susana Mountains in partnership with the California Department of Parks and Recreation, Dr. Kent Christensen taught a group of 10 enthusiasts about the traditional Chumash way of starting fires with hand and bow drills. As many readers may be aware (likely from watching TV's Survivor), it is very difficult to make fire – the endeavor requiring a delicate balance of just the right amount of pressure upon the drill (hint: not too much), holding it at the correct angle and rapidly bringing the bow back and forth over the drill. For a number of the participants, being on bended knee for an extended period of time posed the greatest challenge. But in the end, two of our number mastered the art – Lorie Lawrence and Dodd Harris. FPSSM board member Lorie Lawrence making fire. Chatsworth Park Elementary School third grade students visit the park. They learn about native plants, wildlife, and birds, and how to use their eyes, ears, nose and touch to explore the park. 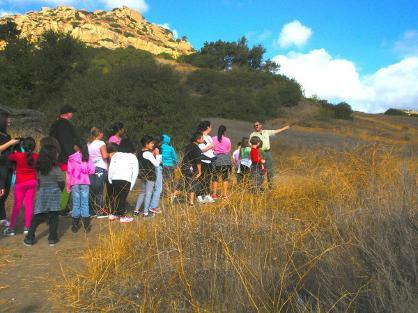 Four classes of third-graders from Superior Street Elementary visited the Santa Susana Pass State Historic Park for an interpretive program. The volunteers showed the children native plants, wildlife, and birds, and how to use their eyes, ears, nose and touch to explore this special historic place. They also played with Chumash toys made out of native plant materials, and sang a song accompanied by a Chumash musical instrument called a clapper. A model a stagecoach seat was on display on the Stagecoach Trail, created by using exact measurements from an authentic original. Seated in the replica, children learned about the middle bench – never shown in the movies – and that stagecoaches actually carried nine people inside. Visitors can access the Santa Susana Pass State Historic Park at the 10200 block of Larwin Avenue in Chatsworth. The park is open daily from sunrise to sunset, and no fee is required to enter. The program was made possible by financial assistance from the Chatsworth Neighborhood Council and the Foundation for the Preservation of the Santa Susana Mountains, and with transportation provided by Councilmember Mitchell Englander. The children meet “King Richard” –- a king snake who was rescued by State Parks staff. 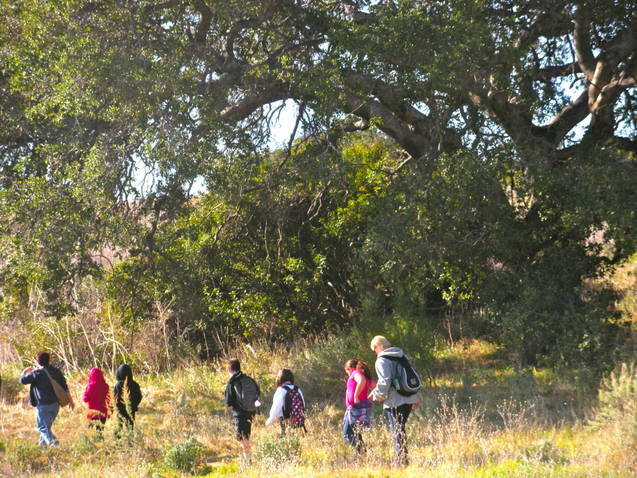 Three classrooms of 3rd graders from Chatsworth Park Elementary School visited the Santa Susana Pass State Historic Park for an interpretive program sponsored by the Foundation for the Preservation of the Santa Susana Mountains. The Tuesday program was made possible through financial assistance from the Chatsworth Neighborhood Council. Thirteen volunteers told the 66 children about the history of the area. Some children had a chance to sit in a model stagecoach seat that was created by using original measurements from an old-time stage. The volunteers talked about native plants, wildlife, fires, birds, keeping the park clean, and using one's eyes, ears, nose and touch to explore this special historic place. The children met “King Richard” –- a king snake who was rescued by State Parks staff after being found by the side of the road, injured from being run over. He was nursed back to health at the Angeles District headquarters in Malibu Creek State Park. On Tuesday, he awed the children with his graceful movements and gentle mannerisms. Interpretive Specialist Karma Graham from California State Parks and Recreation accompanied King Richard. 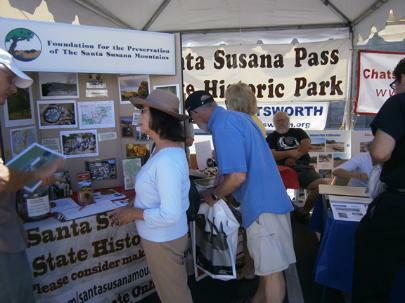 Visitors can access Santa Susana Pass State Historic Park at the 10200 block of Larwin Avenue in Chatsworth. The park is open daily from sunrise to sunset, and no fee is required to enter. Past Events - We Were There! The Foundation shared a tent with Save Chatsworth at the Metro Orange Line Extension grand opening at the Chatsworth Train Depot on June 30, 2012. Hundreds of attendees were provided information about the Park.